Whispers turn into howls if this goes unchecked, and it’s cheap enough to have a very big impact on the game. You may even be able to slowroll this until you can play this plus a cheap creature in the same turn, guaranteeing the 2-for-1. 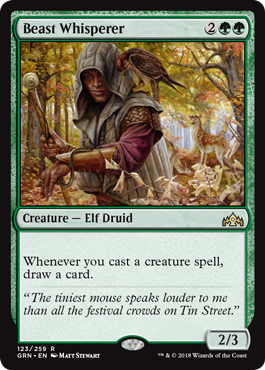 I’d up my creature count if I had this, but it’s great even in a deck with as few as 12-14 creatures, just because the effect is so strong and the cost is relatively low.